Front cover of music sheet for <i>Zazel</i>, composed by G.W. 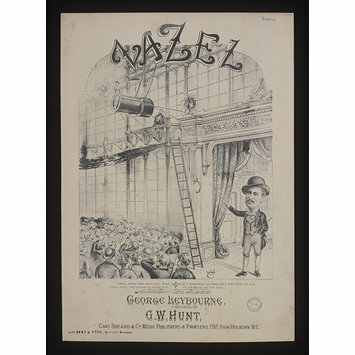 Hunt, and performed by George Leybourne. 'Zazel' was the stage name of Rosa Richter, an acrobat known as the 'human cannonball'. Published in London by Charles Sheard & Co., ca. late 19th century - early 20th century. 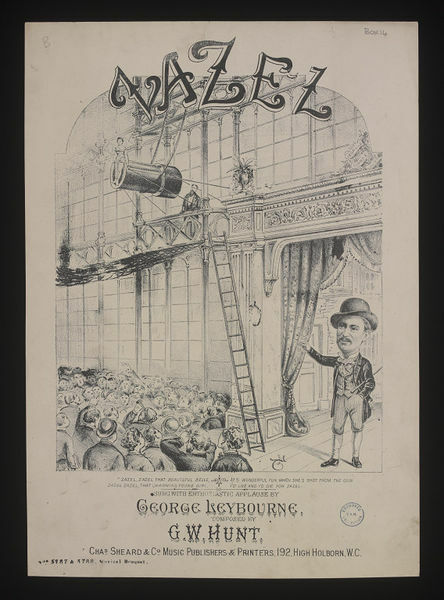 Front cover of music sheet for <i>Zazel</i>, composed by G.W. Hunt, published in London. Illustrated in black and white with scene of Zazel, the human cannonball, suspended over a large audience. A gentleman addressing Zazel, probably the performer George Leybourne, is visible in the foreground, on the right. Verso features opening bars of the song, piano and vocal score. Front cover of music sheet for Zazel, composed by G.W. Hunt, published in London ca. late 19th century - early 20th century.